Jurmet is an innovative, high quality brand producing cutters, slitters and winders for packaging and flexo industries. The machines are produced in the company’s factory in Poland, which allows high quality control from the beginning until the end. The machines have a great web tension control, they are easy to operate and build to last. The compact design will save space. The company have more than 30 years of experience in developing and building machines that are specialized in the production of flexible materials. 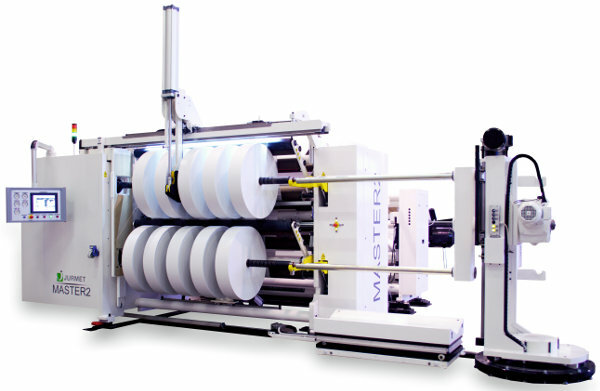 The Jurmet machines can work with many kinds of materials like packaging film, self-adhesive paper, self-adhesive labels and labels printed on foil, shrink foil, para transmission foil, aluminium, laminates, HSH foil, paper, non woven, and other technical materials designed for different industries. Jurmet develope and produce an advanced laser knife positioning system for slitter rewinders for flexible packaging materials, and Jurmet obtained a European patent for the laser knife positioning system. It enables operators to minimize downtime and position the knives efficiently and precisely. In Euro Machinery we are selling a variety of Jurmet machines that are tailored to a variety of production requirements working with different kind of materials. See all Jurmet slitter rewinders and label rewinders here. See all Jurmet Core cutters here. Please contact us if you would like to buy a Jurmet Core Cutter or Slitter Rewinder.